Howdy and welcome to another Sunday at the Paper Players! 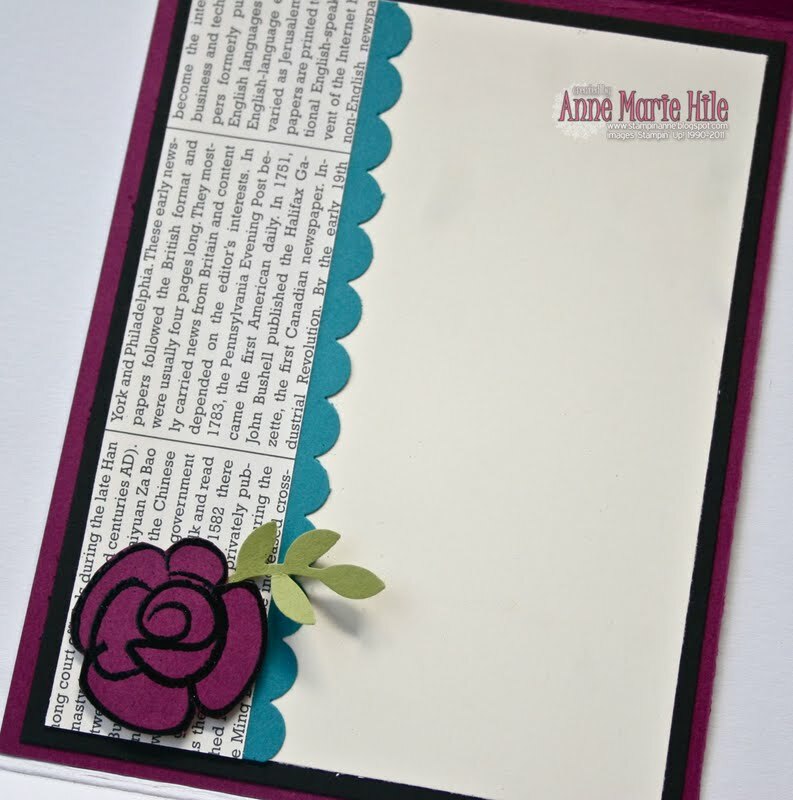 This week, our sketch challenge was designed by the lovely Nance and it's a lot of fun! I hope you will have the chance to play along with us this week. I was a little, ok, a LOT under-the weather yesterday, so getting my mojo on was tough. I dove into my drawers of card stock and pulled out three colors that seemed to appeal to me. I selected Rich Razzleberry, Old Olive and Island Indigo (a new In-Color for 2011-2012) as the basis for my creation. I haven't used Island Indigo yet...don't know why, it is soooo pretty! Satin Ribbon is FABULOUS!! It ties perfectly every time and it is hands-down my favorite ribbon EVER! 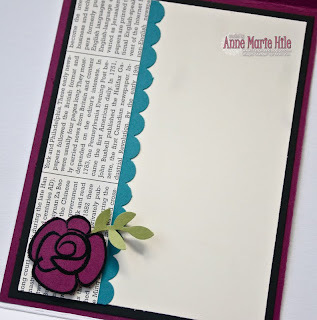 the Color Spritzer Tool made an appearance on the bottom of the card using an Island Indigo marker to add a little more pattern around the sentiment and of course, nothing is finished without a little BLING! Thanks so much for stopping by today! 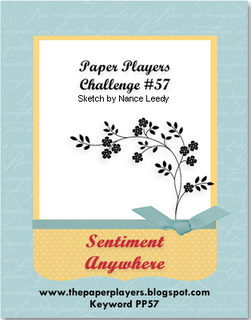 Please visit the rest of the Paper Players Design Team to see what they have created with Nance's awesome sketch. I sure hope you will join us this week! You have until Friday August 5th at midnight (PST) to play along. Now...I can't believe that you haven't used Island Indigo! It is my new favorite color for sure. Love it. You picked some great colors to pair it with on your gorgeous card. Love the inside too! Your card is beautiful and i like these colors together. The newspaper print looks fabulous too. I hope you are feeling better!!! Even feeling under the weather you managed to come up with a bright and cheery card!! Love the color combos (and I love Island Indigo)....that bow is to die for!!!! Hope you feel better, there is nothing worse than not feeling well, but in the summer is just the pits. Your card is beautiful and love the color choice and love Island Indigo, haven't used it yet myself. Great card, now curl up with your fur babies and get some rest. Anne Marie this card just POPS! Love your colors and anything newsprint is my new favorite thing. You can't believe how many old dictionaries I've been tearing up! I'm even using it in my class this week. Hugs. So beautiful! I love this colour combination and sketch. The First Edition paper really looks great with those rich colours. Hope you're feeling better now. Absolutely gorgeous colors, Anne Marie! And the pearls are the perfect touch! Your cards are always so classy! Great job with Nance's fabulous sketch! Aw, I hope you are feeling better! I would not have known you weren't feeling well by looking at this card---it's terrific! This card is super cute. Love the bright colors. 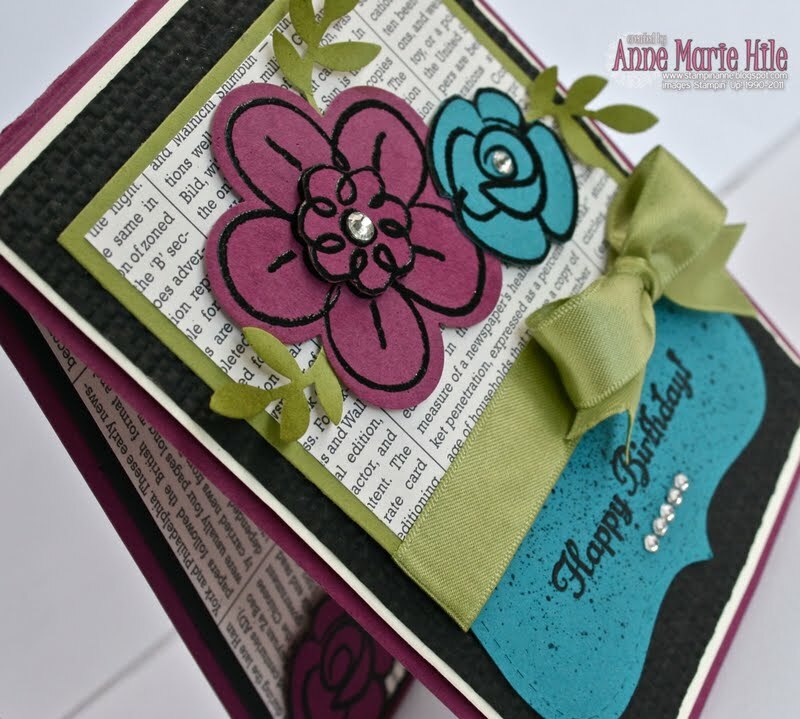 I love the colors & your layout Anne Marie! You're so right about that DSP too....it IS very versatile---I was browsing through the catty & saw it on a LOT of projects and now I can't wait to get my hands on it!! Love the inside of your creation too...TFS!!! 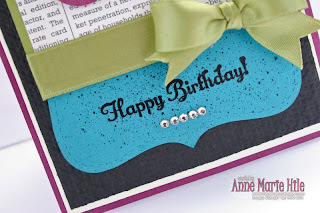 I have been having a hard time with this stamp set, but I love how you stamped and embossed it with black. I will have to try that. TFS!! I hope you are feeling a bit better now, Anee Marie. 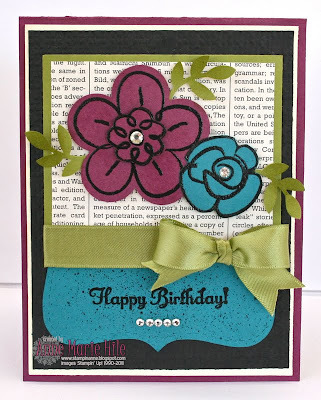 I love the colours that you have used on this card and the background texture looks fantastic! Anne Marie this is such a gorgeous creation .... love love love the colour combo, bright bold and beautiful ... am loving all the elements you have incorporated into the card as well!! !